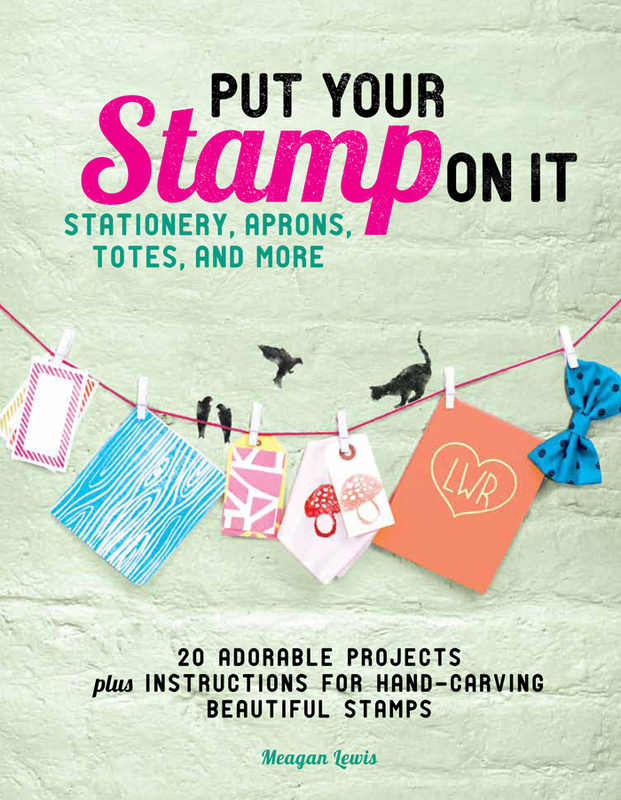 The folks at Chronicle Books have sent over a lovely DIY - perfect for a last minute Mother's Day Card Idea an excerpt Meagan Lewis' book, Put Your Stamp On It! As Lewis explains in the little video clip (below), people may not realize how easy it is to make your own stamp. 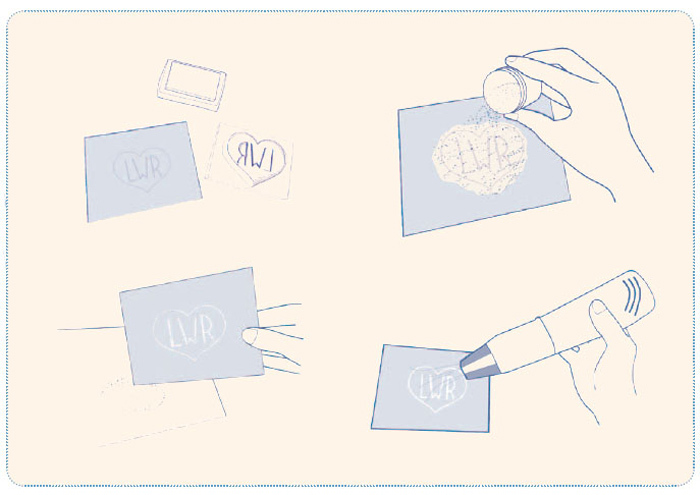 So with that said, she's offering us her instructions to hand-carve an adorable monogram stamp and then alos how to emboss it while you're at it! And then afterwards, enter (by leaving a comment here) to win a copy of the book! Good luck! 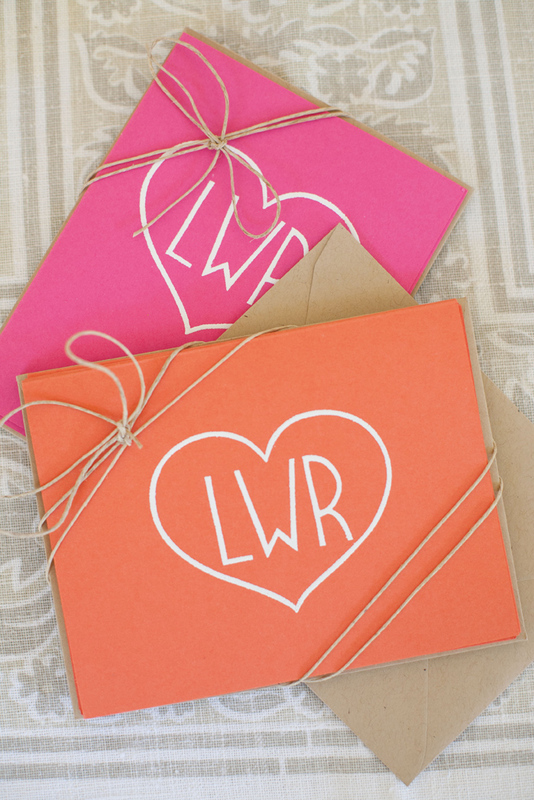 Personalized stationery makes a thoughtful and useful gift. Use a monogram from the template provided or create your own. This project requires embossing—a fun and relatively easy way to give cards or envelopes an elegant and polished look. Similar in effect to thermographic printing and engraving, embossing is accessible and inexpensive, and requires relatively few materials. The embossing powder is heated and transforms the stamped design into a raised and shiny print. Choose the size and number of letters for your monogram. For a monogram 11⁄3 in/35 mm tall, set your copier to enlarge the template by approximately 150 percent. For a two- or three-letter monogram, make an enlarged copy of the template and cut out the letters. With double-stick tape, mount the cut-out letters onto a new piece of paper. Make sure the letters are straight and spaced evenly apart. Create a new copy so that you have a single sheet from which to trace and transfer the design to the rubber. Apply ink to your stamp with the clear embossing ink pad and print onto the card. Because timing is critical when embossing, stamp only one card at a time, and complete the following steps before repeating the process. Place a piece of scrap paper underneath the stamped card, then pour the embossing powder onto the wet print. Cover the print completely and generously. You can shake it ever so lightly to ensure the powder sticks to the print. Gently tap the card over the scrap paper to get the excess powder off. You will see that the powder has stuck to your printed monogram. Any remaining powder can be carefully wiped away with your finger (or, for pieces stuck in isolated areas, removed with fine-point tweezers). Any powder on the card will melt and stick to your card, so you want to make sure you get all the unwanted powder off! Excess powder can be poured back into the jar of embossing powder. Hold the embossing heat gun at an angle to the card, away from you and the hand that is holding the card in place. Turn the heat gun on and move the nozzle around to distribute the heat around the print. You want to have the heat gun about a finger’s length from the print. The powder will take 20 to 30 seconds to melt and seal. Once you see one area of powder melt, move the heat gun to any other areas that have not yet melted. Turn off the heat gun and leave to cool once the entire print has melted. Your print is now permanently sealed to the card. Set the card aside and allow it to dry. Repeat steps 2 through 5 for each card. In this project we used a white embossing powder. It turns opaque when embossed so the color of ink underneath will not show through. If you would like the ink color to show, you can purchase clear embossing powder and print with a colored pigment ink pad. When embossed, the clear powder will melt and the color of the ink will show through and appear shiny and raised. Please enter to win a copy of Put Your Stamp On It, by Meagan Lewis by commenting below. We will announce a winner Tuesday, May 14th! Deadline to enter - 6pm Monday, May 13/13. Good Luck! Great giveaway, I hope I win! I've always wanted to try my hand at this! Would love to learn how to carve stamps. such an awesome giveaway...i would love to learn how to do all of this! I would love to win a copy of this book! I've tried stamp carving in the past, but I can never get them to look good. This book could be the answer! Looks like a great book! I've used rubber stamps in the past but have never hand carved them. Such a great idea and the book looks like just the thing I am looking for to inspire my creativity! This book looks packed with great projects. Thank you so much for hosting this giveaway. Oh how fun! Count me in! Thanks! So fun! I love this idea! Great tutorial! I love the white ink against the bright colors. Oh this would be such a great resource for me! Fingers crossed! Sounds like a lot of fun! I've got my fingers crossed! oh my goodness, I would so love to win this inspiring book! Oh! This is an amazing giveaway! Thank you so much! This book is on my Amazon wish list - I'd love to win it!! This book looks great with amazing projects! Fingers crossed for the giveaway! great giveaway, I would love to get this book! This is awesome! Would love to use this to craft! Fun giveaway! Looks like a crafter's must-have book! Great book! I hope I win! Oh, I really like the cover and I'm sure that the rest of the book is even better. Maybe I`ll be the lucky winner? My mom and I used to stamp together when I was in early elementary school. I think it's a hobby she would love to pick back up. What a great way to help her jump start it! I didn't even know there were stamping books out there. Thanks for the giveaway! Looks like a fun book! so unique and cute! I'd love to win this! Anon commenters - don't forget to leave a contact! It looks absolutely adorable - would love to get the book and try myself! Great giveaway Jan! Fingers crossed! I would love to learn embossing and carving stamps, awesome giveaway! Thanks! Oh no! I don't think my comment ever went through.. I was having some trouble with posting, but I thought it was just awaiting moderation! Shucks! !